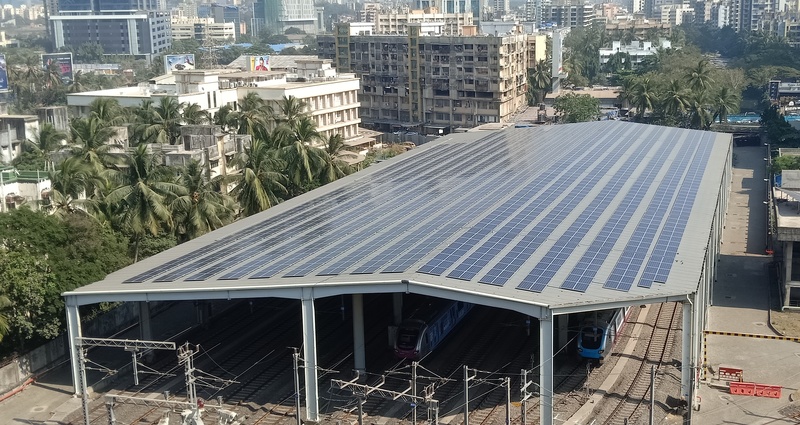 Mumbai, Metro Rail News: Reliance Infrastructure promoted Mumbai Metro One has completed the installation and commissioning of 612 KWp capacity of roof-top solar photovoltaic panels at Metro Depot in DN Nagar. A total of 2,000 rooftop solar panels have been installed at Metro Depot along with associated supporting and cabling work. Earlier MMOPL had installed and commissioned solar capacity of 2.30MWp at all 12 Metro stations commissioned in April 2017. Installation of the solar panels and associated works at Metro stations was a challenging task. In spite of hindrances like sloping roofs, the exceptional height of stations like Western Express Highway and work on a running Metro line, the Electrical and Mechanical team of Mumbai Metro One successfully executed the task without any inconvenience to commuters or affecting operations. Earlier, Mumbai Metro One had also initiated retrofit installation of LED lighting at Metro stations and depot to reduce energy consumption. plants will be around Rs. 50 lakh. The total installed capacity including stations and depot campus is now nearly 3 MWp. Electricity generated from solar panels will be utilised for operations of various equipment like lighting, air-conditioning, lifts, escalators, and pumps, among others. due to solar power generation is around 17,000 tons and due to LED lights is around 1,000 tons annually. Thus, the total carbon footprint saving because of Mumbai Metro is around 1,16,000 tons annually.